In computer programming, a thread pool is a software design pattern for achieving concurrency of execution in a computer program. 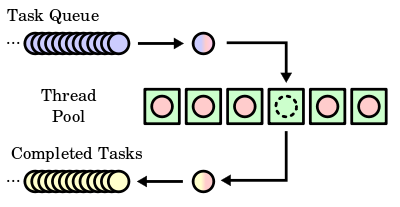 Often also called a replicated workers or worker-crew model, a thread pool maintains multiple threads waiting for tasks to be allocated for concurrent execution by the supervising program. By maintaining a pool of threads, the model increases performance and avoids latency in execution due to frequent creation and destruction of threads for short-lived tasks. The number of available threads is tuned to the computing resources available to the program, such as parallel processors, cores, memory, and network sockets. A common method of scheduling tasks for thread execution is a synchronized queue, known as a task queue. The threads in the pool remove waiting tasks from the queue, and place them into a completed task queue after completion of execution. The size of a thread pool is the number of threads kept in reserve for executing tasks. It is usually a tunable parameter of the application, adjusted to optimize program performance. The primary benefit of a thread pool over creating a new thread for each task is that thread creation and destruction overhead is restricted to the initial creation of the pool, which may result in better performance and better system stability. Creating and destroying a thread and its associated resources is an expensive process in terms of time. An excessive number of threads in reserve, however, wastes memory, and context-switching between the runnable threads invokes performance penalties. A socket connection to another network host, which might take many CPU cycles to drop and re-establish, can be maintained more efficiently by associating it with a thread that lives over the course of more than one network transaction. Typically, a thread pool executes on a single computer. However, thread pools are conceptually related to server farms in which a master process, which might be a thread pool itself, distributes tasks to worker processes on different computers, in order to increase the overall throughput. Embarrassingly parallel problems are highly amenable to this approach. Creating too many threads wastes resources and costs time creating the unused threads. Destroying too many threads requires more time later when creating them again. Creating threads too slowly might result in poor client performance (long wait times). Destroying threads too slowly may starve other processes of resources. ^ Holub, Allen (2000). Taming Java Threads. Apress. p. 209. ^ Makofske, David B.; Donahoo, Michael J.; Calvert, Kenneth L. (2004). TCP/IP Sockets in C#: Practical Guide for Programmers. Academic Press. p. 112. ^ Yibei Ling; Tracy Mullen; Xiaola Lin (April 2000). "Analysis of optimal thread pool size". ACM SIGOPS Operating Systems Review. 34 (2): 42–55. doi:10.1145/346152.346320. "Query by Slice, Parallel Execute, and Join: A Thread Pool Pattern in Java" by Binildas C. A. "Work Queue" by Uri Twig: C++ code demonstration of pooled threads executing a work queue. "Windows Thread Pooling and Execution Chaining"